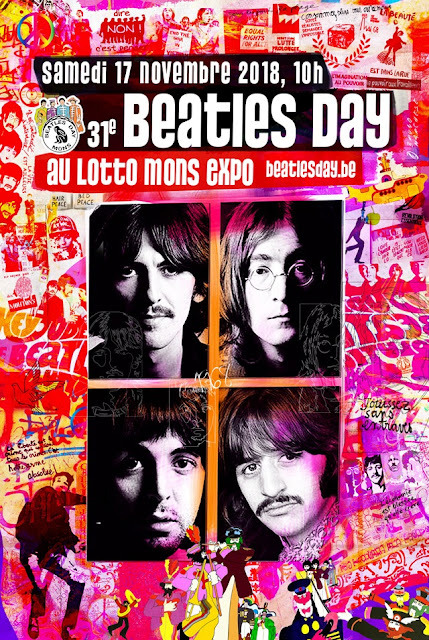 Dublin's BEATLES DAY is taking place this year on Saturday, November 3rd. It will be at the Workman’s Club in Dublin city centre. The events on the day will include a two set show from the Scottish band REVOLVER. 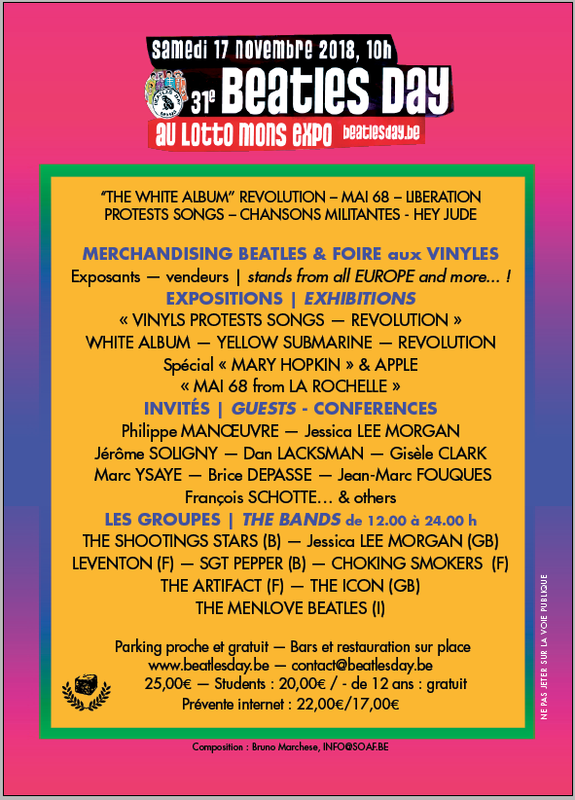 In the first set – to celebrate the 55th anniversary – REVOLVER will play the exact same set of songs The Beatles played in Dublin in November 1963. And in their second set – they will play a wide selection of other songs from The Beatles. There will also be a performance of the play WHEN THE BEATLES CAME TO DUBLIN – and the hugely popular BEATLES TABLE QUIZ is back again. Tickets go on sale this coming Wednesday (August 15) at 10am. The cast of Let It Be took a break from rehearsals in London this morning (Wednesday 8 August) to become Day Trippers on a Magical Mystery Tour to recreate one of The Beatles’ most iconic images. Today marks the 49th anniversary since the world-famous Abbey Road crossing photograph was actually taken. To mark the anniversary, Let It Be’s very own Fab Four followed in the footsteps of the biggest band in music history. 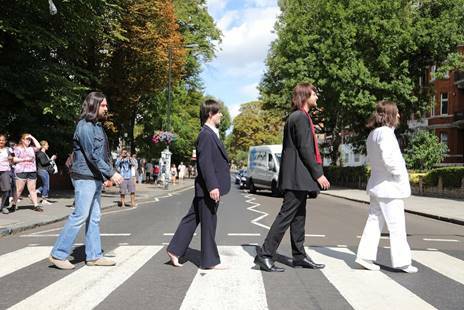 The cast pulled on their costumes to recreate the iconic Abbey Road album cover picture at 11.30am – 49 years to the day and the exact time when it was photographed by Scottish photographer Iain Macmillan on 8 August 1969. West End smash hit show Let It Be: A Celebration Of The Music Of The Beatles returns to stages this Summer and Autumn to premiere the new updated show to audiences across the UK and Ireland. Beatles fans are invited to join John, Paul, George and Ringo for a great night of live music – from the early beginnings to the height of Beatlemania. In a twist from the original Let It Be show, audiences will then be invited to Imagine what it would be like to see The Beatles reunite for one night only. The second act is set a decade after The Beatles went their separate ways. It gives fans a rare glimpse of how the Fab Four once again Come Together to perform. The concert that never was. In two weeks, the updated Let It Be production will be premiered in the UK and Ireland when it opens at Cardiff’s Wales Millennium Centre on Tuesday 21 August 2018. The show will then embark on a UK and Ireland tour visiting the Everyman in Cheltenham; Liverpool Empire; Nottingham’s Royal Concert Hall; the Gaiety Theatre in Dublin; New Theatre in Hull; Edinburgh’s Playhouse Theatre; Orchard Theatre in Dartford; and Manchester’ Opera House. The show will then head to Europe and overseas, with the international tour taking in countries including Germany and North America. It is also hoped that the show will return to a London theatre in late 2018 or early 2019. A cast of talented musicians will play the Fab Four. The performers have already toured the show to entertain on some of the biggest stages in the world including Broadway. The Let It Be cast are Michael Gagliano from Woking (John Lennon); Emanuele Angeletti from Italy (Paul McCartney); Irish/Australian John Brosnan (George Harrison); and Ben Cullingworth, from Market Harborough in Leicestershire (Ringo Starr). The band will be joined on stage throughout the tour by musical director Michael Bramwell on keyboards. Michael Gagliano has already appeared as John Lennon in the new Let It Be show in North America, Canada and Japan, as well as on the West End with the original show. Here's your chance to hear from the authors of two new books. If you aren't going to International Beatleweek, this is a fabulous opportunity to get to hear from the authors of these fab new books for the low price of just £5! There are people who know about The Beatles, and then there are people who know about the The Beatles. Gail and Kenneth know about The Beatles. I mean really know, about the The Beatles. And before they jet off to Liverpool for the International Beatles Convention they are going to be swinging by 'Matters Of Vinyl Importance’ where Kenneth and Gail will be talking about Kenneth’s latest book ‘Sound Pictures - The life of Beatles producer George Martin’ The second book in the two-part biography of the man popularly known as the fifth Beatle and the follow-up to the award-winning ‘Maximum Volume’. Kenneth will be joined by Gail who will be talking about ‘Give Me A Chance’ her true story of sneaking into John Lennon and Yoko Ono’s famous Bed-In for peace to get an interview for her school newspaper. The Lennon’s asked Gail to stay for all eight days and she’s been writing ever since. Gail and Kenneth will also be answering your questions and signing copies of their respective books. Doors 6:00pm for 7:00pm start. Kenneth Womack is an award-winning music writer and one of the foremost experts on the Beatles.His books include The Cambridge Companion to the Beatles (Independent Music Book of the Year 2009). He is Dean of the Wayne D. McMurray School of Humanities and Social Sciences at Monmouth University. Kenneth delivers Beatles talks to audiences around the world and is regularly invited to share his insights with global media, from Huffington Post to the BBC. Gail Renard is a Bafta award-winning television writer and performer. Her work includes BBC, ITV and C4 comedy and children’s series, as well as books, films and stage plays. Gail is a former Chair of the Writers’ Guild of Great Britain and its current TV Chair. She passionately defends writers’ rights in the digital world; still fighting for justice as John and Yoko taught her.